Are you looking for a counsellor in Esher or Surbiton. I am a psychotherapist/counsellor who offers Individual Counselling / Psychotherapy and Relationship and Psychosexual Counselling in Esher, Surrey. My practice is close to Surbiton and Kingston Upon Thames. Contact me direct for counselling in Esher, Surbiton or Kingston Upon Thames. Do you want to understand yourself and your behaviour more or would you like to make changes in your life, resolve relationship issues, understand what makes you tick? Have you decided now is the time to change? Are you at a crossroads in your life, feel confused, depressed, anxious, or in need of some support and someone to talk to. Maybe you want to resolve relationship issues or address destructive patterns in your life. Perhaps you want to reach your true potential, restore your self confidence and rebuild your personal belief systems or empower yourself to reach your goals. I believe we are what we think, if you can imagine it you can achieve it. The best way to predict your future is to create it. If you can dream it, you can become it. Each individual has the power to change the way they think, which can help them to make positive changes in their behaviour. Most of us are experts at negative self-talk but we can reprogram our internal dialogue so we give ourselves positive messages instead. Whatever your goal, I will do all I can to help you attain it. I work together with you to help you achieve your personal goals. Reprogramme your internal dialogue now to work in a more positive way to help you achieve your goals and eliminate negative thought patterns, through hypnotherapy, psychotherapy/counselling or a combination of both. Stress and Anxiety are increasing for everyone and everyday life is more stressful than ever. Talking therapy has been shown to help individuals deal with stress and anxiety and can give you coping strategies which can help you whether you suffer from stress, anxiety, depression or other issues. 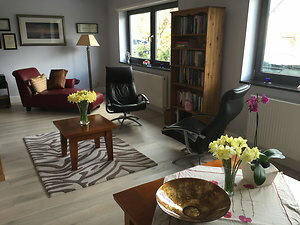 As a counsellor in Esher, I can offer individual psychotherapy/counselling appointments at my private practice in Esher. Parking is available in Esher, see location map. Counselling/Psychotherapy is the provision, by a qualified practitioner, of a formal and professional relationship within which clients can explore difficult, often painful emotions and experiences. These may include feelings of anxiety, depression, trauma, or perhaps the loss of meaning of one's life. You may come because of difficult experiences you’ve been going through, such as a relationship breakdown, bereavement or redundancy, or you may want help dealing with feelings of sadness or low self-worth that don’t seem to be connected to any particular event. A Psychotherapist/Counsellor works with people who have emotional, behavioural, psychological or mental difficulties. The client is encouraged to talk and explore their feelings, beliefs, thoughts and sometimes, relevant aspects and events in their childhood and personal history. It is a process that seeks to help the person gain an increased capacity for choice, through which the individual becomes more autonomous and self determined. Therapists work to help the client understand more about their problems and then make appropriate changes in their thinking and behaviour and sometimes the work can be quite long term. Brief therapy is also possible, especially to help someone resolve a more immediate crisis. Counselling/Psychotherapy provides a regular time and space for people to talk about their troubles and explore difficult feelings, in an environment that is dependable, non-judgemental and confidential. A therapist should respect your viewpoint, while helping you to deal with specific problems, cope with crises, improve your relationships, or develop better ways of living. Counsellors/Therapists don’t usually offer advice; instead they help you gain insight into your feelings and behaviour and to change if necessary. Sessions usually take place once a week but some people may feel they require sessions more than once a week. Making this regular commitment gives you a better chance of getting to the heart of your difficulties. There are a number of different psychotherapeutic approaches: Cognitive Behavioural, Psychodynamic, Psychoanalytic, Systemic (Family & Relationship), Humanistic, Integrative, Transpersonal, Experiential, Hypno-Psychotherapy, etc. Whatever therapeutic approach you chose, research has shown the most effective 'talking therapies' are those where there is a good working relationship between the client and the therapist, so the most important thing is to find someone you feel comfortable working with. It's not the approach that heals, it's the relationship between you and the therapist. Counselling therapy for stress, anxiety, depression in Esher, Surbiton and Kingston Upon Thames. Sexual therapy for psychosexual issues in Esher, Surbiton, Weybridge or Kingston Upon Thames. Close to Thames Ditton, Hersham, Hampton, East Molesey, Cobham. Counsellor and Psychotherapist in Kingston Upon Thames, Surbiton. Esher is close to Kingston Upon Thames, Surbiton, Cobham, Thames Ditton, Walton, Hersham, Weybridge, Walton on Thames, Hampton Court and East Molesey.